The accommodation comprises ground floor, basement retail/office space; with further office suites on the 1st, 2nd & 3rd floor within a five-storey building, and *car parking for up to 3 vehicles at the side. The suites benefit from suspended ceilings, network points in some areas, desks & furniture and fitted with shared kitchenette/WC facilities. The ground floor and basement retail/office unit is self contained, with it's own private WC, kitchenette and basement storage facilities. 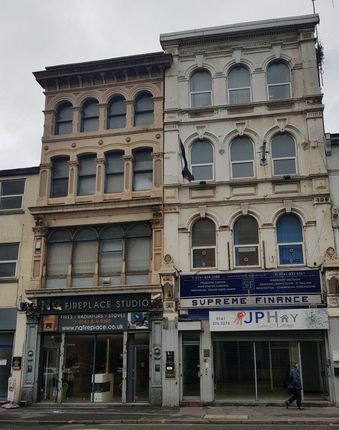 The property is located on Swan street which is a continuation of Great Ancoats Street on the A665 inner ring road into Manchester City Centre. With excellent transport links, less than a 2minute walk to Shudehill Metro Station, with both Manchester & Victoria Station close by. City Centre restaurants & shops are also within close walking distance. The property has a small car park for up to 3 vehicles; with additional parking in the immediate vicinity including the Arndale Car Park & an ncp. Office rental: From (£24 per sq ft) rent only + bills + rates. *All inclusive pricing also available please call to discuss options. Male/Female W/C Facilities with wash basins. The kitchenette and dining area is shared with other occupants. Rental: From (£12 per sq ft) - £1500 pcm, rent only + bills + rates. Each floor is available to rent separately. Ground floor and basement retail/office space - electricity is individually metered, with the (gas/water) being shared as per below. 1st, 2nd and 3rd floor offices - electricity, (gas/water) is on a shared supply, billed by supplier to landlord/tenants, and split based on office size. Lease type (Fri- Full repairing and insuring lease) lease with term to be agreed. Months rent and deposit required. Where a change of use is required and for A3 café, restaurant or take away type businesses, a larger non-refundable deposit will be required whilst awaiting planning. *Car parking is additional to the rent, and starts from £150 per car per month. Up to 3 spaces available. A property with a rateable value of not more than £12,000, the ratepayer will receive a 100% reduction in their rates bill. This will be subject to a small business rates application form; however, rules for a second property may vary. 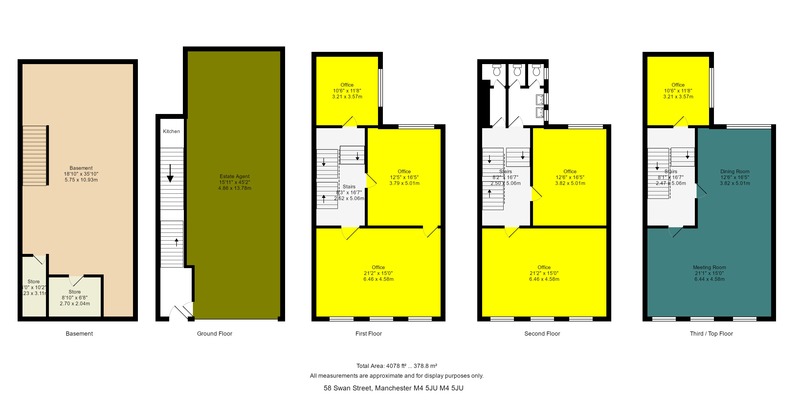 The combined Rateable Value for 1st, 2nd & 3rd floor available space is £11,675. Rateable value for the ground floor and basement retail/office/storage space as of April 2017 is £9800, with information received from the valuation office website (voa). This information has been provided for guidance only. Please consult Manchester Council for exact bill estimates & up to date information. We understand the property is assessed within Band d-87, and a copy of the EPC is available on request. Should you have any further question please don't hesitate to get in touch. For more information please click on on Email Agent or call Diverseciti UK today. Please use the Zoopla message box to confirm: Your requirement in terms of sq ft, Use, Preferred viewing times, Rental budget if available and any other information to help us better serve you. *Property availability maybe subject to change, please call our office as well as landlord to verify before proceeding with your enquiry or arranging a viewing. Unit sizes listed are approximate and price may vary, dependent on size or location of the office/units within the business centre. **Potential for sub division or use as shared space subject to demand; the cost for such works required to divide the units being payable by the tenant. Misrepresentation Act 1967 Diverseciti UK Ltd for themselves, for any joint agents and for the vendors or lessors of this property whose agents they give notice that: 1: The details contained within these particulars are set out as a general outline only for the guidance of intending purchasers or lessees and do not constitute, nor constitute part of, an offer or contract. 2: All descriptions, dimensions, references to condition and necessary permissions for use and occupation, and other details are given in good faith and are believed to be correct, any intending purchasers or tenants should not rely on them as statements or representations of fact but satisfy themselves by inspection or otherwise as to each of them 3: No person in the employment of Diverseciti UK Ltd or any joint agents has any authority to make or give any representation or warranty whatever in relation to this property. 4: All rentals and prices are quoted exclusive of VAT. *Unit sizes listed are approximate. Property descriptions and related information displayed on this page, with the exclusion of Running Costs data, are marketing materials provided by Diverseciti UK Ltd, and do not constitute property particulars. Please contact Diverseciti UK Ltd for full details and further information. The Running Costs data displayed on this page are provided by PrimeLocation to give an indication of potential running costs based on various data sources. PrimeLocation does not warrant or accept any responsibility for the accuracy or completeness of the property descriptions, related information or Running Costs data provided here.